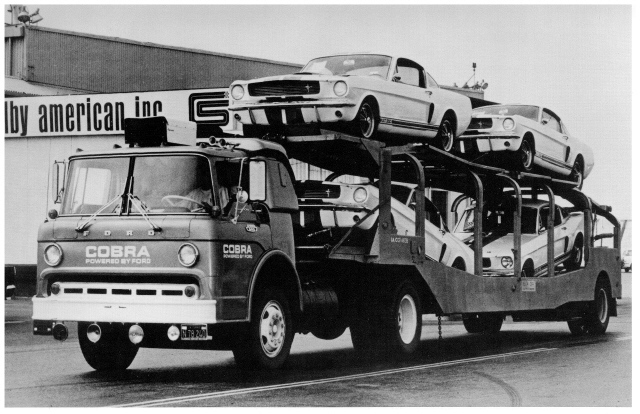 A truck load of Carryover '66 GT350's leaving Shelby American, Inc. for delivery to dealers. As production of the 1965 Shelby GT-350s wound down, Shelby American began work on the 1966 version. In order for them to continue their operations during the Ford Assembly plant shutdown, Shelby American ordered 250 “K” Code 1965 Mustangs toward the end of the 1965 Mustang production run from San Jose. This ensured that they would have cars available to “carry-over” the Shelby American plant until they received their initial shipment of 1966 Mustangs. Those 250 cars, plus the two 1966 prototypes, make a total of 252 cars that started life as 1965 Mustangs, but were converted into 1966 GT-350s. These cars are sometimes referred to as “carryover cars”, “crossover cars”, “change-over cars”, “early ‘66 cars”, “leftover ‘65’s” or “65½ cars” and had a distinctive combination of 1965 and 1966 GT-350 features. 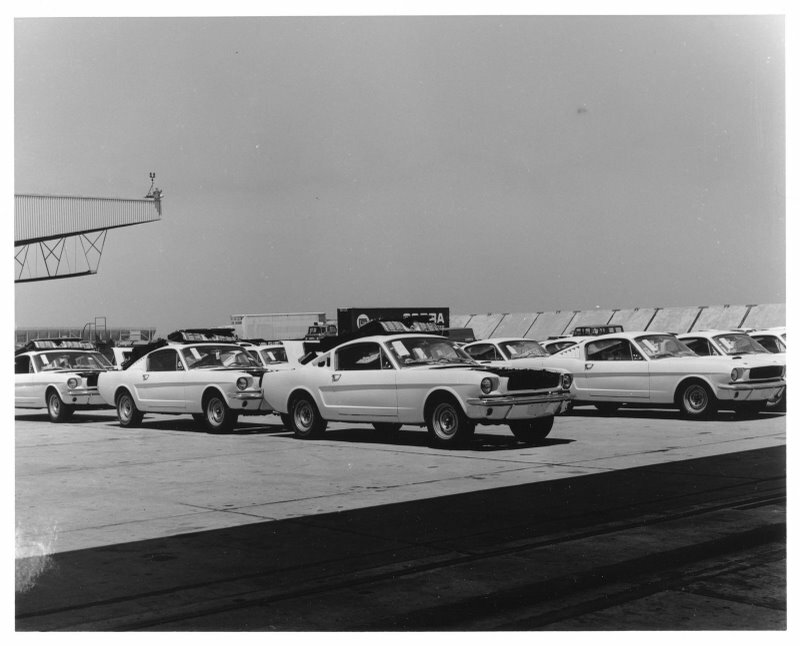 These cars provided Shelby with enough inventory to start production of the 1966 GT-350s during the July/August Ford factory shut down to re-tool for the upcoming 1966 models. Without these early cars from Ford, Shelby American would have had to shut down their assembly line for about a month and a half until the new 1966 Mustangs arrived in October. These cars are sometimes referred to as “carryover cars”, “crossover cars”, “change-over cars”, “early ‘66 cars”, “leftover ‘65′s” or “65½ cars” and had a combination of 1965 and 1966 GT-350 features. Specific characteristics of the 1966 Carryover cars can be found on the “Unique Features” page. In the picture above, a group of these 1965 Mustangs begin their transformation into 1966 GT-350s. On the windshield of each car, pieces of paper were attached that identified what Shelby VIN each car would carry, as well as showing the original Ford assigned VIN. Above, the paper taped on the windshield of the first car identifies it as 6s10X. While it is more difficult to see, the papers in the other windshields may identify the cars directly behind that car as 6s09X and 6s08X. Notice the Steel Wheels and the back seats laid on top of the roofs of the closest cars. Why Do We Call Them “Carryovers”? 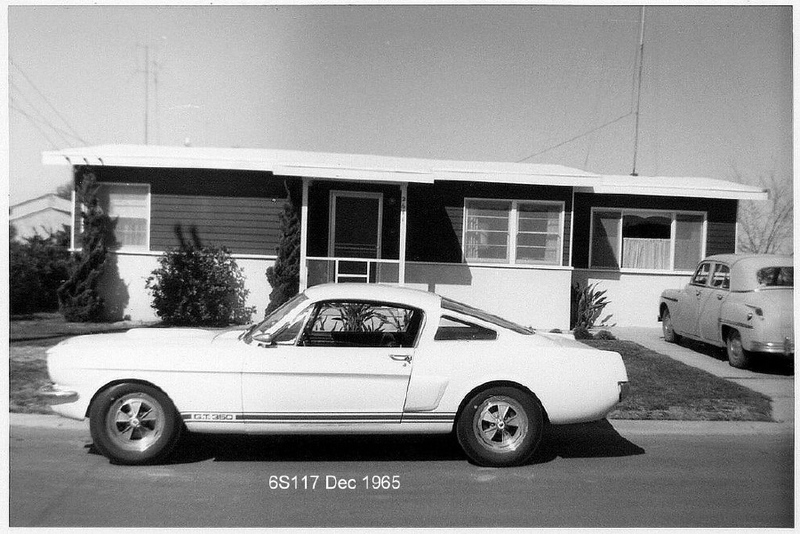 Many terms have been used over the years when referring to the first 252 cars that became 1966 GT350s. We chose “carryover” because it’s short and it conveys something about the history of the cars – to “carry over” the Shelby American production line during Ford’s retooling shutdown. And combining the two words into one represents the combining of 1965 and 1966 features into one car. We’re fully aware that these cars were never called “carryovers” at the factory. But over the years there are many examples of enthusiasts coining a distinctive name for cars they love. For example, Ford never built a “deuce coupe,” but this has become a common name for 1932 Ford coupes. Likewise, Shelby didn’t call their racing GT350s “R-models” at the factory. That term was coined years after production ceased by enthusiasts who appreciated the cars for what they were. So, in choosing a short descriptive term to use for these cars, we are simply following a time honored American automotive tradition by providing a special name for a car we are passionate about. If you prefer some other term, or nothing at all, then go for it. After all, “a rose by any other name…”. Email UsIf you have questions about carryover cars send us a note!